Your Garden offers a comprehensive range of garden design services for our clients. We offer a number of garden design packages aimed at providing our clients with an appropriate and affordable solution, whatever their design requirement may be. Our garden design service is friendly and uncomplicated, with the flexibility to handle projects of any size or scope. We believe that the key to any successful garden design is you, the client. Our role is to work with you to find the design and style that is right for you and your budget, whatever that may be. The starting point is to get to the heart of what you want. There aren't any set rules and every design is bespoke and tailored to your specific requirements. It's about what you like - and what you don't - after all, it's your garden. You can find more samples of our garden design work in our online portfolio, or contact us to find out more. 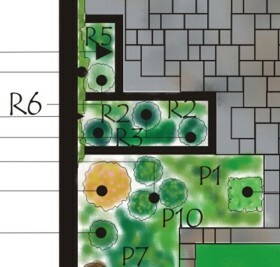 To make things easier and affordable we offer two types of garden plans. 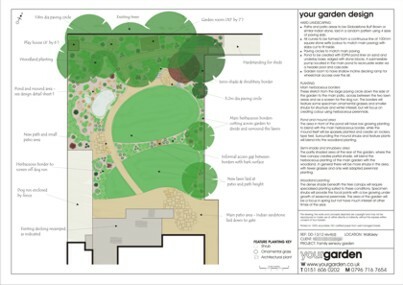 Our full garden design package is a CAD produced A3 colour garden plan and our compact garden plan is A4, hand drawn and suitable for smaller gardens. You can find out more about our garden design philosophy and the types of garden designs we do at Garden Design Wirral - our partner web site. 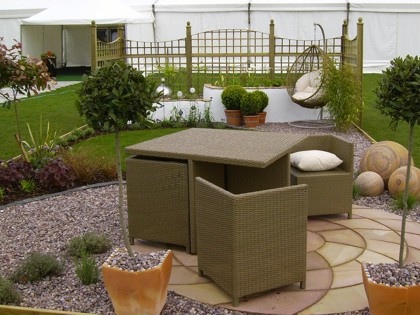 Based on the Wirral, Your Garden offers garden design services throughout Merseyside, Cheshire West and North Wales. Initial consultations are free in our main area of operations, which you can find here.